Ustad M Aslam Bawarchi is an experienced caterer and cook. He provides all kind of food on order for weddings and other important events. 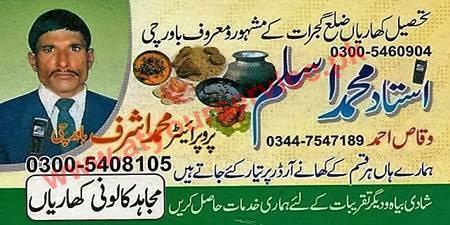 Ustad M Aslam Bawarchi is located on Mujahid Colony, Kharian. He is an experienced caterer and cook. He provides all kind of food on order for weddings and other important events.